Stephen Cranford from BBC Radio Sussex will be narrator for the first half of the programme and Music Director Dominic has written a stunning brass fanfare to open the celebration concert. This will be followed by an oratorio composed In 1947 by Gerald Finzi set to a specially written poem by Edmund Blunden with title ‘For St Cecila’. The composition is intended to be a celebration of music’s patron saint and is for tenor soloist, chorus and full orchestra. The WPO is fortunate to have James Olsen as a Composer in residence. 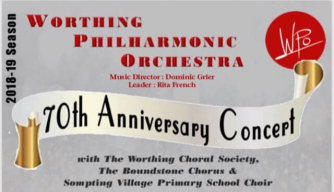 To mark the 70 year history of the WPO he has composed a Worthing Oratorio with title ‘The Line is Immaterial’ which will have first performance in the Assembly Hall by the orchestra together with Worthing Choral Society, The Boundstone Chorus and Sompting Village Primary School Choir, all regular live music makers alongside the WPO. The theme for this new work is a celebration of live music making in Worthing and James will be giving a pre-concert talk at 6.30pm and will explain his reasoning and structure of the work. Vocal soloists will be from the Countess of Munster Musical Trust and the Royal Opera House’s Jette Parker Young Artists Programme thanks to Dominic’s connection with the Royal Opera House. Having a large symphony orchestra and chorus in the hall, the second half of the celebration programme is devoted to the mighty Beethoven Symphony no 9 ‘The Choral’.